From a quick glance, NEO Scavenger is just a Flash-based roguelike developed by a one-man team. However, like an expert scavenger, it has very few resources, but knows how to make the most out of them and create something truly valuable. Combat, for example, is turn-based and doesn’t feature any graphics. 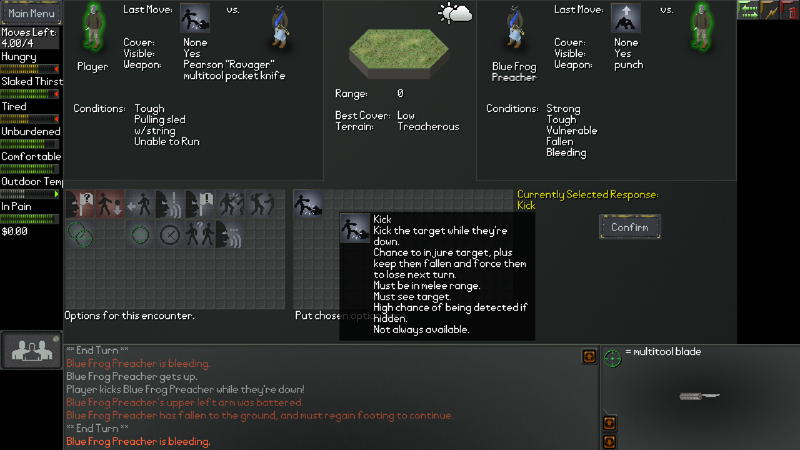 You select commands, such as “shoot”, “kick” or “sneak towards”, and the combat log will describe what happened. While this may seem crude, it allow for actions that even triple-A games find too complex to animate, such as head-butting, leg tripping and even grappling (with mods). Still, the most interesting aspect of the game is how it obfuscates its stats. NEO Scavenger never tells you how many hit points you or your enemy have, how much damage a weapon does or to what extend a concussion or a fever affects you. Everything is up to your own judgment. You don’t replace your baseball bat for a machete because the game says it does more damage, but rather because you – the player – feel safer with it. It’s a very bold design decision in this DPS-driven era, and one that succeeds in transmitting an unique sense of tension, as you roll in the mud, tired and wounded, attacking another desperate survivor with a tree branch and wondering who will drop dead first. Every aspect of NEO Scavenger follows this logic. 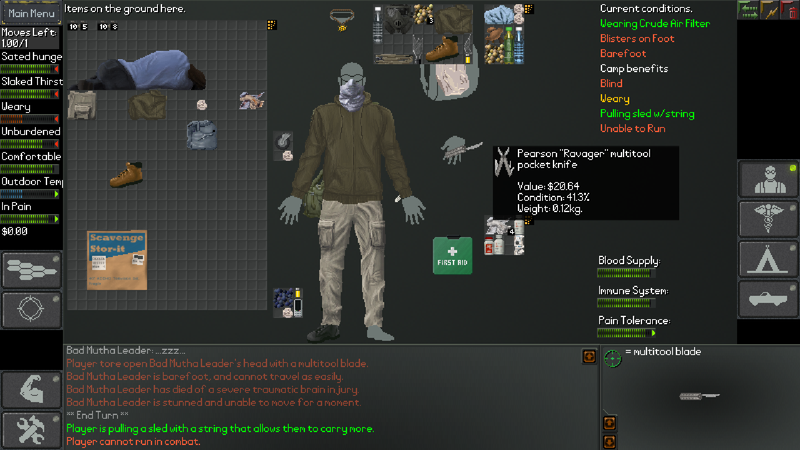 The game features a robust survival system that requires you to regularly eat, drink, sleep, threat your wounds, protect yourself from the cold and medicate against diseases. Of course, not every water you find is safe for drinking, and eating meat without cooking it might be a bad idea. Even something like wearing two right-feet boots can result in blisters and affect you negatively. Is it worse than walking around barefoot? It’s up to you to figure it out. Along the way, you’ll die – a lot. But it’s okay, the fun in NEO Scavenger lies precisely in learning how to survive this harsh post-apocalyptic world. During your first few tries you’ll care for nothing but hiding from the roaming mutants, finding your next meal, a source of fresh water and not dying of hypothermia. The many characters you create won’t level up nor gain experience, but after a while you – the player – will learn how to scavenge, craft useful items, assess risks and survive for a few days.